Evan Lovett and Glossblack's "Welcome to Fishtown" mural is located at 1140 Frankford Ave.
Fishtown is on a roll with animal-inspired murals. Earlier this year, people across Philly rejoiced over the appearance of a mural depicting a squirrel with a SEPTA token near Norris Square. Evan Lovett, the artist behind the squirrel and token, may have one-upped himself this weekend. 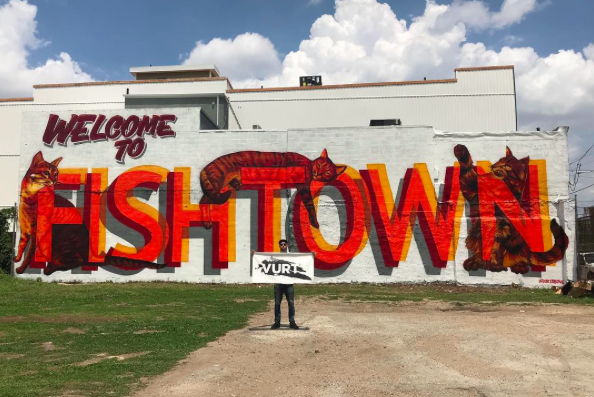 Fishtown just got its own "Welcome To" mural at 1120 Frankford Ave.
Lovett is creative director of the non-profit Visual Urban Renewal and Transformation (VURT), which strives to inspire and unify urban communities through the power of public art. The cat mural was designed and completed in collaboration with Philadelphia-based artist Jimmy Glossblack, who previously worked with Lovett on the Pigeon Mural at the Berks El stop and the American Bald Eagle Mural under the El along Front Street. Why cats? Lovett told Streets Dept Fishtown is just a logical place for cats to be hanging out.